Hope The Younger and I believe we have seen all the Miyazaki films now, including Animal Treasure Island, Lupin The 3rd, and Pom Poko. Our UrgeToComplete is turning us to Pixar, and luckily Anne Thompson tipped us to this the other week. "The Adventures Of Andre And Wally B" was the first Pixar short, way back when Pixar was a division of Lucas Film. Now the question is, have we seen every Pixar film? Once we check these boxes, we might as well move on to TheEntireHistoryOfFilmEVER! Nice tribute featuring over 500 scenes from Pixar's 11 features. Did you ever wonder why you shouldn't give guns and other dangerous weapons to birds? Next time you eat a bagel, think twice before feeding flying friends -- at least if you happen to have any nuclear bombs within your reach. We think this has a bit of feel like a Pixar picture in progress. This music was composed using chords, bass notes, & vocal samples from one very excellent movie. Nothing like borrowing from a friend to make something new. 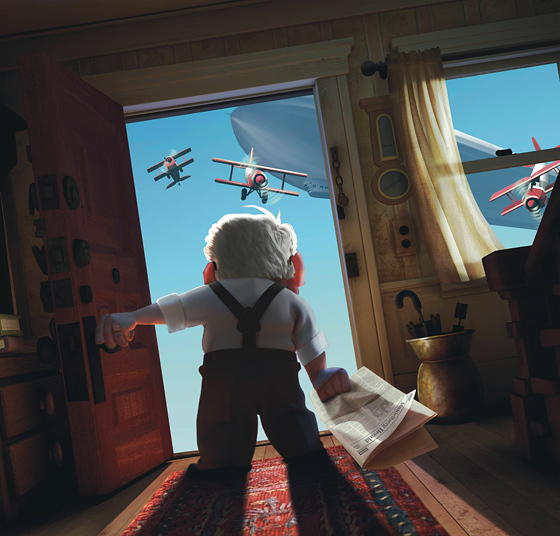 Pixar wants you to think about UP. We happen to like that movie so we are happy join in the thinking. Where were we? How'd we miss that this was Pixar's next? And no robot? No cute creature? A grumpy old man?! I guess it's clear we didn't go to ComicCon. Still it looks pretty neat. Carl Fredricksen spent his entire life dreaming of exploring the globe and experiencing life to its fullest. But at age 78, life seems to have passed him by, until a twist of fate (and a persistent 8-year-old Wilderness Explorer named Russell) gives him a new lease on life. UP takes audiences on a journey where the unlikely pair encounter wild terrain, unexpected villains and jungle creatures. The forest on the edge of Tokyo that inspired Miyazake to create MY NEIGHBOR TOTORO is being threatened. Where does beauty go when we let it disappear? Hmmm. The good folks at Pixar are sponsoring an auction (you know, like on eBay) of all these great drawings to help save the forest. Tell your folks. Tell your friends. But you don't have to buy anything. The best things in life are always free, right? They have set a website showing work by other artists inspired by this movie. I could look at this site for hours. In fact, I have! Everyone loves this movie, but how great is it to see how it has inspired so many imaginations? 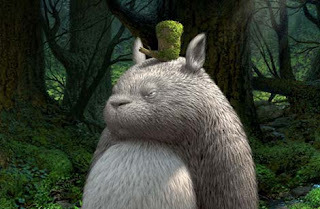 Now there's another project for a rainy day: where's your Totoro? Let's see those drawings.